If you’re tired of trying to pass off a random assortment of bowls and plates as deliberately eclectic whenever you have company, have lost vital bits of tableware to chips or spectacular smashes, or are simply looking to trade in a tired set for something more exciting, our list of the best dinnerware from our favourite retailers may prove an interesting read, but there are some things to consider before you go all in and snap up the first set you fall in love with. First off, there’s the material. Porcelain tableware is a popular choice, made from fine clay (usually kaolin) and loved all over for its glassy, smooth finish and resistance to chipping. Bone china is a mix of kaolin clay with bone ash, extremely durable, and fired to a beautiful borderline translucent finish that commands higher prices than most and is particularly suitable for formal place settings, but still tough enough to be microwave and dishwasher safe. On the other hand, if you’re after a more rustic look, you might want to consider stoneware. Its single firing means it doesn’t usually achieve the bright white finish or porcelain or bone china, but many prefer it for its comfortingly weighty feel – not to mention its more pocket-friendly price. In terms of the pieces that’ll come in handy, many of our sets have already made that decision on your behalf. Offering carefully curated selections of 12 to 16 individual pieces for maximum versatility at the dinner table, these typically include dinner plates, side plates, and a small soup or cereal bowl, while larger sets may also include mugs for a full house. The two exceptions to this are our House by John Lewis set, which comes in sets of three for the potential to mix and match, and our Cox & Cox Dip Glaze range, which groups its pieces into sets of four mugs, plates, and bowls. Reviewers were amazed at the finesse, simplicity and sturdiness of this set, representing the ideal meeting between timeless design and durability. For that, it’s hands-down our best investment set. If you’re going for all-white dinnerware, you might be weighing up with a simple supermarket set, but for everyday tableware that’s smart enough to double up for special occasions, those who own them say these beautifully fine pieces can’t be beaten. Looking for a change from white? These artisanal plates and bowls are about as different as it gets. For a colourful, covetable table, this thoroughly modern set from MADE takes the cake. The tonal grey and yellow colourway is super on-trend, an unusual change from white for a more eclectic look – not to mention, if you get confused about the settings, they’re colour coded! If you find a uniform look staid, the subtly uneven lips of the bowls and gently curved plates are a lovely little organic detail that varies from piece to piece. Plus, when anyone asks, you can truthfully say they’re hand-painted by skilled artisans in Portugal – much more exciting than saying you picked them up in TK Maxx. 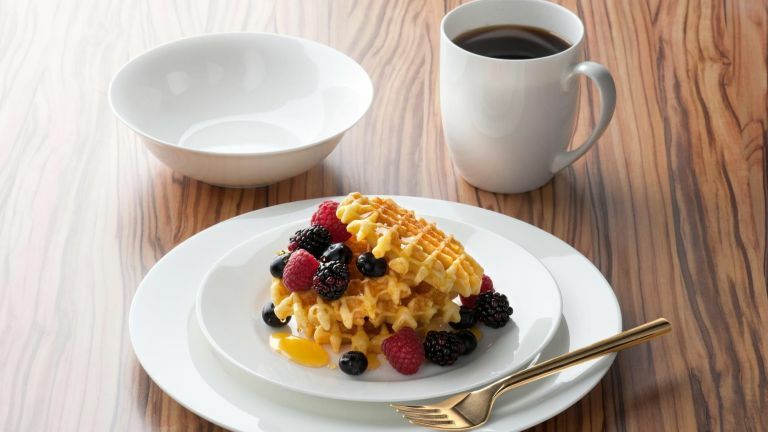 Designed and crafted right here in the UK, Denby dinnerware is a classic choice for those dedicated to reshoring, or just anyone who’s looking for a standout set that can be loved for years. This stoneware dinner set is no exception – glazed in two different colours to achieve the dazzling speckled effect that gives the Halo collection its name, each piece is unique, but every one is finished to guard against chipping and be dishwasher-, microwave- and freezer-safe, making for a durable set that you won’t have to keep locked up for special occasions, even if it looks more like an art than flatware! If classic white doesn’t quite do it for you, but you’d rather play it a little on the safe side for longevity’s sake, this contrast set is a great middle ground between striking and sensible. The choice of grey, dark blue, black or blush trim and contrast inner adds interest to otherwise plain white tableware, and the fact that it comes in a set of three gives you the flexibility to mix and match colours if you wish. Reviewers loved the fine, shiny finish and the fact that it’s dishwasher and microwave safe, making it as practical as it is stylish. This dinnerware collection from Cox & Cox is about as simple as it gets, and therein lies its beauty. While it might have the rustic look of stoneware, thanks in part to that gorgeous putty colour, it’s actually porcelain clay, handmade and fired to perfection for an ultra hard-wearing finish. While that characteristic glazed porcelain shine is also there, giving a polished look, the real charm is where it contrasts with the unglazed white base for textural interest. Protect your new plates, and your table, with our marvellous, mediating pick of the placemats.